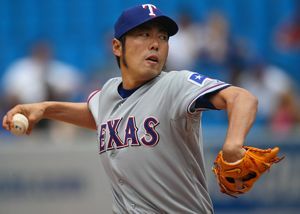 The Red Sox announced that they signed reliever Koji Uehara to a one-year deal. Gerry Fraley of the Dallas Morning News first reported the agreement, which includes a $4.25MM base salary, according to Jon Paul Morosi of FOX Sports (on Twitter). Uehara is represented by SFX. Uehara, 38 in April, posted a 1.75 ERA, 10.8 K/9, 0.8 BB/9, 1.00 HR/9, and 32.5% groundball rate in 36 innings this year, missing time with a strained lat muscle. He'll join Andrew Bailey and Junichi Tazawa at the back end of Boston's bullpen. Uehara came to MLB from Japan in 2009, and has dominated as a reliever when healthy despite an average fastball velocity below 89 miles per hour. Among pitchers with at least 200 career innings, Uehara's 7.97 career K/BB ratio is the best in baseball history. He ranked 35th on my top 50 free agents list. The Red Sox have committed $150.95MM to free agents Uehara, Mike Napoli, Shane Victorino, David Ortiz, Jonny Gomes, Ryan Dempster and David Ross this offseason. However, Napoli's $39MM deal hasn't been announced, as there appears to be something holding the agreement up.